After his escape from the trap that the Wizard Wizban set around Grolbult's hideout, the goblin Lieutenant escaped and rallied his forces. When his marauders came upon a monastery, they professionally looted it, killed all the senior priests and kidnapped the Abbot, who begged for his live, claiming he was worth a royal ransom! Now, his guards have caught a group of adventurers that have freed the abbot and are trying to escape with his prize under the cover of a spell. No doubt this annoying wizard was behind this! First things first...he has to recover the abbot before he gets away. Use only wizard and rogue Lore cards up to lvl 6 (included) for this adventure. Grolbult: Every unit that you kill, gives you 1VP, the abbot in your hands gives you also 1 VP. If you have 5 VP you win the game. If the abbot falls into the hands of the RED unit, you MAY kill him, depriving you of the VP he brings but ensuring he cannot be saved. 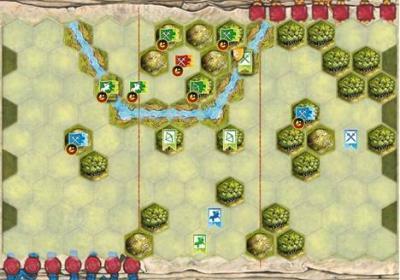 If the human Green infantry is eliminated, Sergeant Thristan is considered lost and thus Wizban looses 1 command level. Discard 1 card at random from your hand. Your command is now 1 and your hand is 4. The abbot counter: starts with your green infantry who saved him from the goblin camp. he can be passed on to another ADJACENT unit by having BOTH units spend a battle action. If the unit he is with is killed, he is picked up by the next unit that moves in his square (ending that unit's move), friend or foe. If he ever is in a hex without a unit and it's the turn of Wizban's forces, he can move 1 hex controlled by the Wizban player without using an order for him. he is not considered a unit and cannot be the target of lore cards. The RIVER is considered fordable and the fords do not stop movement.